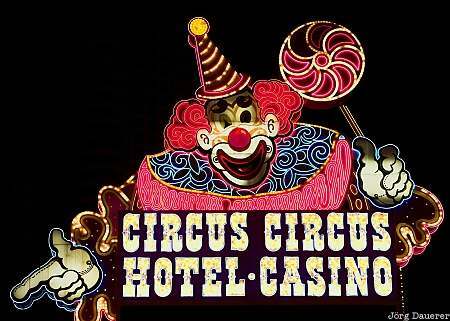 The Clown on the neon sign of the Circus Circus Casino and Hotel at The Strip (Las Vegas Boulevard) in Las Vegas at night. Las Vegas is in southern Nevada, United States. This image was taken in the late evening of a sunny day in October of 2006. This photo was taken with a digital camera.